When I have a long run on the schedule I usually run with my running buddy because we all know that miles fly by when you have someone to run with. Every now and then I will meet with a running group if the time and day work out with my schedule. After several times meeting the group, I began to wonder why I even meet up with them. Sure groups can be motivating, but isn’t the point to stay together in the group? Every time I meet with the group, I find myself just running with my running buddy solo anyway. The runners that meet up are either at a different pace or not running the same mileage we plan to. It is such a process from the start. Everyone knows what time the run is supposed to take place, but everyone is not on time, so we have to wait. And then we have to discuss how far everyone plans on going, and then wait for everyone to get a signal from their watch. By then it has been at least 20 minutes, I could have had at least two miles done. That is what happened last week during our long run. Since we normally don’t run with others there are different points throughout the route that we usually meet up at such as water fountains and restrooms. But until we wait around for them to get there just to say hi and see how they are doing, we could have another mile down. My running buddy and I were plugging right along so I thought. I was feeling really good and actually keeping up with a faster pace than I normally do on the trails. I asked him how he was doing and he said he was struggling a bit. What? My running buddy struggles??? I found this odd because usually I am the one struggling between us. He is faster than me and he keeps me going during our runs. I thought it was a perfect day for a run, but then again I always like it on the warm side. He thought it was too humid. We had about a mile left into our run and he just stops to walk. He has never done this for as long as we have been running together. Usually he is the one that asks me if I am okay or if I need to slow down or walk. I guess there is a first time for everything. I asked if he wanted me to stop and walk with him, but of course he said no and that he would catch up. I continued the last mile solo, since no one else in the group was running at my pace. Glad it was only a mile to go, because I do not like running by myself without any music. I arrived back to the parking lot and finished with 13.5 miles and waited for him to come. After we were done we met up with a few people from the group to see how their run went, while others had already left. So for me, group runs can be sort of a challenge lately. Sometimes they can even be awkward. This is part of the reason why I always hesitate to join group runs. Being an introvert to start is bad enough, but then to either be struggling to keep up, or much less likely, being faster than most of the group, ending up solo kind of defeats the whole point, doesn't it? I had a few group runs that were fun because we agreed to stay together, but usually that comes at a pace sacrifice for someone. Yea,someone always seems to have to take one for the team. That's interesting - in all the years of running with a group, we've never stopped to wait for people at certain points. We all head out at the same time but pretty quickly spread out...maybe because our groups have never been bigger than 50 people, it's hard to have everyone do the same pace? For me, the beauty of a running group is starting together, knowing there's others out on the route (and passing them coming and going), and hanging out after we all finish. But during the actual run, I might be with only one other person, or sometimes as many as 4 other people. We would never have up to 50. We always start together but usually never stay together. By the time we all are finished we do not end up waiting around for each other anyway since we finish at different times. I used to run with a group a lot. People would respond ahead of time if they were coming and what distance. That way I could see if there would be people running my pace that I could run with. If there was no one running my pace, I would just skip and run alone. I figure if I'm going to be alone anyway, I may as well sleep in! My biggest beef with group runs is how long it takes for everyone to get started! I guess it's not just my running group because you have the same problem! I try to time up my food and bathroom and everything against the start time and then we just stand around and talk for a half hour. Can't we talk while we run?? I think generally the less people meeting for a group run the more likely to start on time. I mean if there is even just 4 people, chances are you're all running together and will start on time. We used to Dis cuss our pave and what distance we planned to do awhile ago when the group was bigger but we don't anymore. Even though it is small we still can't manage to start on time. I think a lot of these reasons are why I just run by myself most of the time. For some reason it seems easier to me than trying to coordinate. It's kind of turned into ME time too. 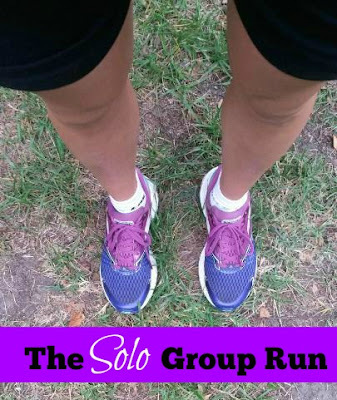 I used to do group runs when I was running, but found myself always struggling to find people to run with because everyone was either slower, or much faster than I am. My last marathon I did nearly all my long runs solo, and I really grew to love that alone time even though at the time it was really hard. I am starting to learn to love long runs myself too. I never thought I would. I love the social aspect of a group run, but I'm always worried that my pace will be different and I'll end up on my own at some point. We have group runs during the evening here, and it never seems like a good time for me. 7pm I've already worked out and eating dinner. I do not like evening runs w groups either. I've liked the group runs I've done, but they were also pretty specific about not waiting for late comers. We always started on time. And often I didn't end up running with someone as there was no one exactly my pace, but I liked knowing there were people in the group around me. It kind of gave me a comfort level from a safety perspective. I feel so slow & awkward I've never even done a group run. The times that I have run with the running groups here have not been like this at all! I do the Thursday runs with The fleet feet group, which gets started at 6:05 on the dot, whether or not GPS are ready. The best thing of this group is that we don't expect to stay together, everybody goes at their own pace. I enjoy those group runs, because if I'm running with 10 other people, it's less tempting to stop and walk. But my long runs I do alone. My fiancé and I go together, but we each do our own route, it's easier for both of us this way. I enjoy our group runs. Like yours, almost no one runs my pace or mileage so I'm usually running on my own. But what I like of the group is that they have mileage suggestions, and if you don't want to run that mileage they have other routes available. So then I don't have to think about that aspect. And they set up SAGs at certain points so I can refuel if needed. Then most of the time a group of people will head out to brunch. Anyone that wants to can join. So while I may never run with anyone, I still feel the comradery. Oh I agree, Group runs can definitely be awkward. I was in a big organized running group in Denver for a couple summers and a) the start locations were often really far away from my house, b) there's so much standing around waiting and getting organized beforehand, and c) trying to find the right pace group is challenging, and d) this might just be socially-awkward me, but I felt like everyone knew each other already and I was this random stranger eavesdropping the conversation. Many years ago I tried the group running thing, and had similar experiences. They've never been my thing, I enjoy solo running I enjoy the run more alone or with one other person at times. But I agree thinking back to those group days, they were awkward and now days with the instant picture posting thing. I have a friend who does group runs every weekend and she gets so annoyed because the group always wants to take a group photo before they start which like you said you could run a mile or two before the run actually starts. I do like running with other people, but understand how sometimes it can be very frustrating. There is one girl in our group that is always late, and that drives me nuts. It is disrespectful to the rest of us who show up on time. I must admit though, I am okay with solo runs and sometimes enjoy those more, since I can dictate the pace the whole time. I have thought about joining a running group, but I am not sure that kind of setting is for me. I run to clear my head mostly. I almost always run alone but have joined in on a group run a few times. It's been a mixed bag. I went to one earlier this year that was an absolute blast but sometimes in the past I've been on runs when I end up running way faster than I planned for the day. I also always worry I'll be the slowest person in the group. It actually did happen once - I got to the meeting spot and realized only four speedy guys were there that day. So I was way out of my comfort zone trying to keep up! You know I live love my MRTT running group. People are pretty good about arriving on time. Usually there is some sort of discussion beforehand about distance. I like group runs but usually I plan to run them alone. I never know if I'll meet other people's paces and I just mentally prepare to be a loner! For me, having people there to meet is motivation to go, and meeting at the end to maybe grab a drink or just hang out is a nice way to feel like I have a social life haha! When I run with multiple people running different distances, we usually try to be as specific about time and place for a meet up so it works for everyone. I've been struggling to find running groups here, but have loved them in the past PROVIDED I find someone who runs my pace (or is running a pace I want to run). I would get frustrated though waiting a long time for people. Either be punctual or you're going to get left! Sounds like you had a fantastic run! I rarely run with a group for this reason! It's challenging to match paces. When I run with my sister, it's purely for fun because she runs quite a bit slower than me. I do match her pace, because I want her to keep running with me!